For centuries, Jerusalem has been a holy place for Jews, Christians, and Muslims. It has been referred to as both the Center of the Universe and the Eternal City. Jerusalem has also been called the City of Peace despite the fact that it has often been the object of bloody battles over religion and territory. Today, Jerusalem is a city within a city. Surrounded by Arab East Jerusalem and Jewish West Jerusalem is the ancient Old City, an area of some 220 acres. The Old City is encircled by walls built in the sixteenth century by the Ottoman emperor Suleiman the Magnificent. Visitors may enter the Old City through one of seven large gates. My wife checked this book out of our local library (along with a dozen other children’s books) for our four-and-a-half year old grandson, Landon. I took last Friday off of work and spent the day with the little guy. After arts and crafts at the library, lunch of (homemade) macaroni and cheese, two or three episodes of Jonny Quest (1964), Legos and other toys, we got down to the business of reading. 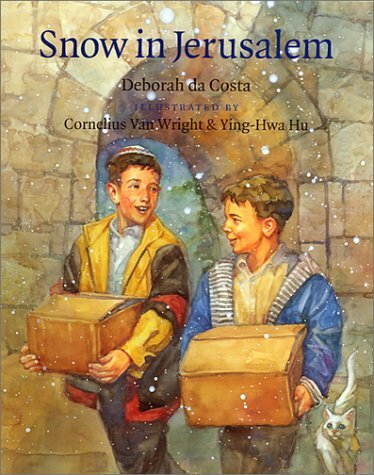 Da Costa’s “Snow in Jerusalem” was one of the books he wanted me to read to him while he was enjoying a mid-afternoon snack. 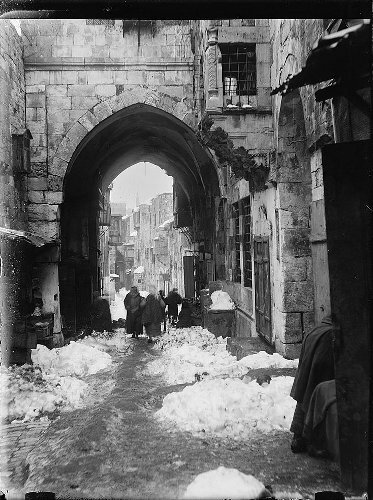 I enjoyed reading the book and especially the feeling of actually walking the streets of the Old City between the Jewish and Arab quarters, but reading the Author’s Note at the very end stopped me cold. I realized that this was a book promoting peace, not just between the characters Avi and Hamudi in the book, but between peoples and cultures. That’s not a bad thing certainly, but there was a further undercurrent suggesting a perpetual sharing of all of Israel, sub-divided between Jewish Israel and Arab Palestine. That’s a popular solution for the conflict between these two people groups, especially among political and social liberals, but it flies in the face of the Bible and I believe is an affront to God. To be clear, I don’t think peace between all the different people of the world is the affront, but I do believe carving up Israel into different chunks for different people like separating the white and dark meat of a turkey on Thanksgiving is. In reviewing various scriptures in the Tanakh (Old Testament) about the Messianic Era and the future King of Israel, I don’t see any references to taking the Land of Promise, which God gave to Abraham, and to Isaac, and to Jacob, and all of the physical descendants of that specific line (and notice Ishmael is not included, nor any of Abraham’s other sons) and splitting it up into Jewish and non-Jewish portions. The only “splits” of the Land involved the different areas given to the twelve tribes of Israel. Messiah will come to return all of the exiled Jewish people to their Land and to rebuild Jerusalem as the Jewish city. These are just a few of the examples in scripture declaring that Messiah will gather the exiles of Israel and restore them to their nation. Peace is a wonderful thing. So is fairness, equity, sharing, friendship, and the like. But how we imagine these general concepts and their application in Messianic Days may not be how they will really play out. Remember, whether you are Jewish or Christian, the Messiah is King, not President or Prime Minister. A Kingdom is not the same as a Democracy. Citizens of a Kingdom ruled by a single Monarch do not get to vote on laws, rules, and ordinances. The King’s Word is Law. We all assume that everyone will get what they want in the Messianic Kingdom. Perhaps that is true, but I suspect for some people it will not be so. What if you’re a Muslim and the Jewish Messiah comes to rule not only Israel (all of Israel) as a Jewish nation, but the entire planet? For that matter, what if you are a Christian and you suddenly realize just how Jewish your “Jesus” really is? What if the King establishes without any equivocation that the Jewish nation is the head of all the nations (rather than the United States of America), and that the Torah is the Law of the Land for Israel and incumbent upon all of the Jewish people? What if some portions of that Torah go forth from Zion, and apply to all the people of the nations who are called by His Name (Amos 9:11-12)? Don’t we get a vote on this? Don’t we have a say? How could this possibly be fair? Where is God’s justice? There will be nothing else but God’s justice on Earth during the Messianic Age. People will get what they need but not always what they want according to the will of God. We will have peace. Our swords will be beaten into plowshares and our spears into pruning hooks, but only after Messiah has led a vast army to defeat all of Israel’s enemies (including, most likely, the United States of America). God Himself will fight for Israel, crush her adversaries, and establish her security. Are you getting the picture. The Lord will be one and His Name, One. Not only will Messiah gather the Jewish exiles and restore them to Israel, but he will act as a banner for the rest of us, drawing us to him. But remember, we won’t get a vote. This is Law. The only and last functioning Theocracy (nation directly ruled by God) on Earth was ancient Israel before the people demanded that Samuel anoint Saul as King. In the Messianic Age, that Kingdom, that Theocracy will be restored. A Davidic King, the last Davidic King will ascend the Throne in Jerusalem again, David’s Throne, which God promised to David and to his descendants forever. For many, many centuries, Israel has been without a King, but it will not always be so. The King is coming. He will return. He will restore his people, the Jewish people, and all of humanity will go up to Jerusalem, and every knee will bow, to the Ruler, the Prince, the King, Messiah, Son of David, the Righteous Branch. With respects to Deborah da Costa, while there will be peace within Jerusalem and her walls will forever be secure, it will not be the sort of peace established by a Jewish boy and an Arab boy arguing over possession of a cat and her kittens. It will be a brutally fought and hard-won peace where real adversaries will spill gallons of blood and mountains of dead flesh will decay in the sun and be eaten by carrion birds. Enemies will be defeated in a war lead by a King whose rule is absolute. Peace will come when all of those enemies are dead, and the survivors of the nations defeated by Israel’s armies and by God must come to Jerusalem once a year to honor the King on Sukkot. Peace comes when the Lord Almighty has spoken it, not when we have imagined some man-made utopia and think we can make it real just by publishing enough books, television shows, and movies based on that fantasy. All that said, we can escape the fantasy and be part of building the way to Messianic peace now, at least a little of it. But we have to grasp onto the “fringes” of the garment of God, so to speak, humble ourselves, and speak the words of the coming Kingdom and the King who is to be. We can choose that path, or deny it and inherit a more terrible end. That choice is ours to make. The King has been patient with us, but his patience will end, and we had better be ready when it does. We are either soldiers in his army or on the side that will see defeat. We will see peace in the Kingdom or find the peace of the grave. The Holy One of Jacob neither slumbers or sleeps. And he is the King. We must bow or be broken. Jerusalem has been called the Center of the Universe and the Eternal City. But it is also known as the City of David. One day it will truly be the City of Peace. I’m reminded of this simple masterpiece by Dylan — sums it up, as you did! Amen! While I appreciate your emphasis on messianic government as a monarchy rather than a democracy, I think it worthwhile to point out that a Jewish theocratic monarchy is unlike other monarchies. The King’s word is not the law; he is not an absolute ruler. The King’s words are to reflect the Torah, because the King must be himself ruled by Torah and by the Heavenly King of Kings. The interpretation and application of Torah remains under the authority of designated Torah scholars — a Sanhedrin, if you will. Thus the government operates with distinct Executive and Legislative branches, though elements of the Judicial are allocated between them. This is how they are defined in Torah, which remains valid and in force until the heavens and earth are replaced — hence they must apply also to the Millennial Messianic Kingdom. Even the Heavenly King’s regent the Messiah ben-David, speaking on His behalf, must obtain the ratification of the Sanhedrin to authorize a legal matter on earth. Individual issues under the Torah system are administrated via magistrates over groupings of tens, fifties, hundreds, thousands, and tens of thousands, and beyond that are probably administered on a tribal/regional basis. So an individual’s legal and civil needs must be resolved at the local level through the local ombudsman, and only if this is inadequate by magistrates over larger groupings. This will probably work a bit like the legal appeals process in US Law. But since Am Yisrael was also responsible in some degree for its ratification of even specific applications of Torah, I suspect that some form of polling will occur. That does not turn the system into a democracy, because the decision-making and enforcement are reserved to these appointed authorities, but the individual does not become a faceless, voiceless, passive non-participant among the background of the masses. I had a feeling you’d come in and fill in the blanks, PL. Thanks. I was trying to dramatically make the point, especially to a Christian audience, that their viewpoint of what the Messianic Era is going to be like probably won’t fit their preconceptions. I wanted to illustrate that it won’t really be a “Christian” Era as such but a Jewish one. It is true that there’s nothing quite like a bracing splash of reality to shake out a preconception or two. You could, perhaps, have hammered home the notion we see in Yohanan’s Revelation, at 2:27, 12:5, and 19:15, about ruling the nations with a “rod of iron” (not to neglect Ps.2:9). That sounds like a pretty firm hand, even if not an absolutist one. Great points, no one has the right to divide God’s Land, not even Israel, they must divide it according to God’s instructions, thus if they divide the land with another country or people, they are breaking God’s commandment, Leviticus 25:23. Joel 3:1-3 comes to mind: “For behold, in those days and at that time, when I restore the fortunes of Judah and Jerusalem, I will gather all the nations and bring them down to the Valley of Jehoshaphat. And I will enter into judgment with them there, on behalf of my people and my heritage Israel, because they have scattered them among the nations and have divided up my land, and have cast lots for my people, and have traded a boy for a prostitute, and have sold a girl for wine and have drunk it. Concerning the Messianic Kingdom, there will be people among the nations who are spared and will enter the Messianic Kingdom, they will not have put on the resurrection, while there will be those from among the nations who have put on the resurrection, this will also be true for some Jews as well. 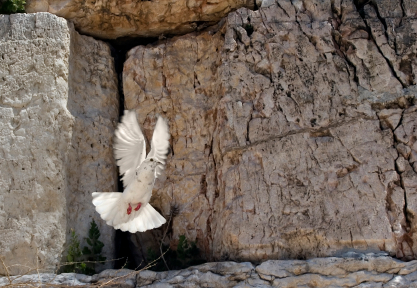 It is interesting, because many do not consider this in their understanding of the Messianic Kingdom, that there will be a distinction even between those who are resurrected and those who are not. However concerning the Land in the Messianic Kingdom, there is going to be an allotment for non-israelites, according to Ezekiel 47… But even then, the allotment given to them is within Israel’s already established tribes, they do not get a separate piece of land for themselves. @Zion — Interesting that you should mention Ezek.47, where the terminology allots portions to “gerim” who “sojourn” in a particular tribal area. Since these are not identified as “b’nei nechar” (foreigners), as in Is.56, one might consider the likelihood that these “gerim” are to be defined by the modern definition, as converts to Judaism — who cannot, of course, claim tribal affiliation genealogically. This would nonetheless allow them to affiliate with and become absorbed into a tribal identity much as modern Israelis choose to live in a tribal region regardless of whether they can trace any hint of genealogical connection to a particular tribe. For example, my wife is from a family of cohanim, though not on both sides. I cannot trace any particular tribal affiliation from my family. But we choose to live near Jerusalem, in the region identified according to Yehudah’s tribal allotment. Friends of ours can identify traces of actual Davidic lineage in their family, but instead of living in the “Matei Yehudah” political/municipal district, they live on the north side of Jerusalem in “Matei Binyamin” (the tribal region of Benjamin). I can only wonder how consistently this might represent conditions that will obtain also in the period that Yehezkel was envisioning. Interesting that you should mention Ezek.47, where the terminology allots portions to “gerim” who “sojourn” in a particular tribal area. Since these are not identified as “b’nei nechar” (foreigners), as in Is.56, one might consider the likelihood that these “gerim” are to be defined by the modern definition, as converts to Judaism — who cannot, of course, claim tribal affiliation genealogically. Since the tribal affiliation is restored in this period of time, it would make more sense that the modern definition of converts to Judaism will no longer exist, but the biblical definition will be restored. What is also of interest, is that according to the Torah the gerim could not own land and were not given an inheritance, but the gerim in this case is allotted land as an inheritance. It could be simply referring to the gerim children, but it seems to clearly state that the ger himself would be allotted inheritance. @Zion — Well now you’ve got me wondering something else, because if the period of time in question is the messianic era / millennial kingdom, and those living at that time are either survivors of the wars of the messiah which established that kingdom or else they are participants in the first resurrection (cif:Rev.20:5), then we must recognize that the participants of the first resurrection will include many Jews who were converts to Judaism in accordance with the “modern” definition of a “ger” that has been in force for at least 2000 years. Since it is also true that HaShem emphasized in Deut.30 that Torah “is not in heaven” but has been made an earthly responsibility, and Rav Yeshua also ratified the authority of the scribes and Pharisees to interpret and teach Torah with Moshe’s authority (cif.Matt.23:1-3a), then two millennia worth of Jewish converts and their children, who have no physical tribal affiliation, must become integrated into the tribal allotments recognized in the Ezek.47 vision of Israeli territory during the millennial kingdom. The Jewish identity of these converts, and especially their descendants, cannot legally be revoked, so this longstanding applied-Torah interpretation and definition must continue to be valid. This would also explain the difference you cited regarding no land ownership by a “ger” in the period when the Torah was written as distinct from the much later Ezek.47 period. Incidentally, this matter of who participates in the first resurrection is a puzzling one. Let’s first clarify that “the rest of the dead” must wait for the final resurrection after the thousand years of millennial kingdom have ended, after which comes the final judgment and the new heavens and new earth. Therefore, if HaShem’s promise to the Jewish people (and particularly to Avraham) is to be considered valid and fulfilled, for the restoration of the Jewish kingdom ruled by the Jewish King Messiah and peopled primarily by Avraham’s physical descendants, then the first resurrection must include the Jewish people of whom Rav Shaul said that all Israel will be saved. However, the only group described in Rev.20:4 as participants in the first resurrection are “those who had been beheaded because of their testimony of Yeshua and because of the word of God, and those who had not worshiped the beast or his image, and had not received the mark on their forehead and on their hand; and they came to life and reigned with the Messiah for a thousand years.” So either there is some means of interpreting this verse to include at least the majority of the Jewish people (i.e., enough to be considered “all” who count for anything in the body of Israel), or this verse describes only one primary subset of those who will participate in the first resurrection. The verse doesn’t quite encompass even all of Rav Yeshua’s disciples who must precede those who are raptured as cited in 1Cor.15:51-52 and 1Thes.4:13-17, which places this resurrection sometime near the beginning of the millennial kingdom. Thus it must be referring to the “first resurrection” cited in Rev.20:4. Therefore it seems reasonable to accept the consideration that this verse describes only a portion of the participants in the first resurrection and that the phrase citing “the rest of the dead” does not include either: 2000 years worth of Rav Yeshua’s “fallen asleep” disciples who join him upon his return in the clouds, or: the resurrected Jewish people who fulfill HaShem’s irrevocable promise to Avraham. You could, perhaps, have hammered home the notion we see in Yohanan’s Revelation, at 2:27, 12:5, and 19:15, about ruling the nations with a “rod of iron” (not to neglect Ps.2:9). That sounds like a pretty firm hand, even if not an absolutist one. True, but I’m trying to rely mainly if not exclusively on the Tanakh at this point, creating a portrait of the Messianic Age from that point of view, without involving scriptures that would be more regularly accessed by Christians. Interesting that you should mention Ezek.47, where the terminology allots portions to “gerim” who “sojourn” in a particular tribal area. Since these are not identified as “b’nei nechar” (foreigners), as in Is.56, one might consider the likelihood that these “gerim” are to be defined by the modern definition, as converts to Judaism — who cannot, of course, claim tribal affiliation. Zion, I know you disagree with the validity of any conversion to Judaism since the ritual is not presupposed in the Torah, but we also have no objection by Jesus or Paul to the existence of converts, even though Paul encountered many of them in his travels. I’d expect that if either the Messiah or one of his most outspoken apostles wanted to “undo” this practice in the various streams of ancient (and modern) Judaism, they had ample opportunity to do so…but didn’t. There are many “no objection” scenarios from Jesus or Paul, to assume they were fine with anything they did not object to, is a logical fallacy, not a very good argument. But concerning ‘Modern conversion’, it would be anachronistic to apply that to the Torah, no matter who you are, also it does not take into account tribal affiliation, because it cannot anyways, makes for another problem in itself. I am not opposed to conversion, as long as, it stays true to the text, trying to say ‘Modern conversion’ is what we read in the text, is being anachronistic, no matter how hard people kick or scream, it does not change what the scriptures say. Take one the biggest issues, when a ger joined Israel, the ger did not become a Jew, as is described by Modern conversions, it is important that a ger does not become a Jew, in order to maintain the fact that a ger could not own land as well as, a host of other distinctions. These are issues, among a host of others, that Modern conversion does not address. Also, Judaism in the state it is, does not accept the Body of Messiah, does not accept Abraham’s adopted children, does not acknowledge God’s other chosen ones, this in itself, speaks of a time when Judaism will change, just as hopefully Christianity is changing right now! It will be interesting to see if Messiah will “undo” the millions of people and their descendants to converted to Judaism over the ages who, in all good faith, believed they were Jewish and lived as Jews. I personally think it’s anachronistic to apply the process of the ancient gerim on modern times since the conditions that presupposed that process no longer exist. It will be interesting to see how the Lord will deal with all of this, we will all just have to wait and see, despite however you think it should or should not go down. The Messianic Kingdom will have the biblical conditions restored and the fact that the biblical model could not be followed for the past 2000 years, which resulted in a non-biblical model being invented, speaks volumes in and of itself. On the other side of the coin, It makes me wonder what is going to happen to all the Christians who were anti-semitic and believed they were the “new” Israel, what are they going to encounter, other than undoing 90% of their beliefs. It will be interesting to see how the Lord will deal with all of this, we will all just have to wait and see, despite however you think it should or should not go down. I’d probably reword that, “despite however either one of us think it should or should not go down,” since neither one of us are in charge of making all the decisions for billions of lives, Zion. I stressed the “Messiah’s Word is Law” idea in this blog post to rattle a few cages, but that doesn’t mean, as PL said above, that there won’t be a system of input and even compassion. The other question (as PL also mentions) is whether or not God will hit the reset button to the time of the closure of Biblical canon or if some of the halakhic decisions made in the first century CE and beyond will endure. My Pastor says that everything “freezes” at the point canon closes, but that probably means most of what modern Judaism and Hebrew Roots is doing today becomes invalid. Ultimately, we all will stand by our opinions without no absolute way to know if that’s exactly how God sees things. Ultmately, Messiah returns and we find out where we got it right and where we didn’t, then we bow before the King and submit to his rule…you, me, everyone. The usual “Christian” view is that Jesus will return and destroy His enemies and establish His Kingdom in an instant rather than fight an actual war. The Bible seems to indicate that there will actually be war and there will be lots of dead people, Onesimus. I know that’s not exactly “neat and clean” but that’s the consequence of going up against Israel when it is defended by God. PL, you offer an interesting perspective concerning the past 2000 years of gentile “converts”, but it is based on ultimately assuming this is true: Rav Yeshua also ratified the authority of the scribes and Pharisees to interpret and teach Torah with Moshe’s authority (cif.Matt.23:1-3a) This is a very debated topic and I assume it will continue to be… I am not convinced that Yeshua acknowledged full authority in this regard. If He did, then your point holds, but if He did not mean this in this fashion, then it falls apart, we will have to wait and see. From my understanding, I think it is a little more simplified, there are two resurrections, one for the righteous and one for the wicked (Acts 24:15). The one for the righteous occurs at the beginning of the Messianic Era, and the one for the wicked occurs at the end of the Messianic Era, facing the Great White Throne Judgement. Now with regard to “all of Israel” will be saved, seems to me, to be an indication in time of history, not necessarily describing the resurrection(even though it will happen soon after or at that moment), but a time frame of once the fullness of the gentiles has come in, at the end, the nation of Israel in a majority sense will be saved by God. So in this case, “all Israel” represents a time period that is dreamed of, when Israel finally as a majority accepts the King, all those who are dead, would not count in this “all Israel”, as it is per this time period and event. More like a last generation event. This does not mean that every Jew in history will have salvation, neither does it mean that every Jew for the past 2000 years is going to parish as is taught by replacement theologist, what it does encompass is a majority of Israel finally following the King of Israel in a literal event that takes place at the end of this age. Those who will be resurrected, will be only those from among the nations and Israel who have trusted in the Messiah, and the gray area where God will save who He wills, and especially towards Israel, due to the blindness He put on Israel. So God has a plan of action to save all He can, which is stated in Paul’s statement in Romans 11:30-32. There will be many living in the Messianic Kingdom, who did not take part in the resurrection, they will have children and generations after them, this is most likely who these verses are referring too. Sadly many think that all unbelievers are wiped out at the instant of Jesus’ return, and that the only survivors will be believers. 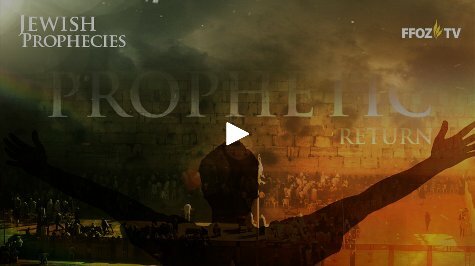 Dispenationalists restrict this even further to the Jews who “converted” during the “Great Tribulation” (considering they believe that “the church” had already been removed in the “rapture”). Sorry about all the ” ” but they seem appropriate to make it clear that I don’t go along with the popular usage of those terms. I have found that a lot of the confusion and wrong ideas about this topic stem from a distinct ignorance of Prophetic writings which spell out a lot of the detail of the period in question, whereas the NT doesn’t give much detail beyond a few things shown in Rev 20. James wrote: My Pastor says that everything “freezes” at the point canon closes, but that probably means most of what modern Judaism and Hebrew Roots is doing today becomes invalid. There is no doubt in my mind, Modern Judaism, Hebrew Roots, Messianic Judaism, Christianity and whatever names or titles we can think of, will have major errors that will be corrected, and will have many humbling experiences both in understanding and perspective. Just look at Zechariah, when majority of Israel comes to the knowledge of Yeshua, they are going to break down and morn, it will be a very sad day, not because they found Yeshua, but because they missed Him for the past 2000 years. I think we, will all be in for a humbling experience, and ready to bend the knee. I agree that none of us in our various religious streams has it all right and that Messiah upon his return, will correct our errors. Yes, it will be very humbling for all of us. Democracy is a good form of government but ultimately, it is only as good as the people involved. I think we can see, especially today, that our Democratic government struggles a great deal to actually represent our citizens, as opposed to the needs and desires of political parties. The flip side is that God gave us a sense of justice and a desire for right. If we were to base our governments on those values and elect men and women who actually lived them out, then our nation would at least somewhat mirror what Messiah desires to see in us. But you’re right Dan, we won’t see true justice across the face of the planet Earth until Messiah ascends the throne of David in Jerusalem, may that day come soon. Winston Churchill is reprted to have said that democracy is the worst kind of government – with the exception of all the rest. The main weakness of democracy is the type of candidate it attracts, and the lengths that those candidates will go to climb to power. The system disadvantages those most qualified to govern justly – as does the human tendency to hope that political promises will be honoured. Thank God that He has a future government planned where human failings and injustice won’t be deciding factors. When Israel called for a man to rule over them instead of accepting that God was their only King, God warned them of the consequences and then gave them what they wanted. The brilliance of the coming Kingdom is that both aspects of Kingship will be fulfilled. In Jesus, not only does Israel get a man as King, but God is also literally restored to the throne that should always have been only His. After mentioning the weakness of democracy above I forgot to mention its strength. The ability to limit the term of a potentially bad government. When a government is completely Good and just, democracy becomes unnecessary. And one day that good and just government will come. Amen.